The number one reason to test is because we are worried about the future. How do we know if things are really wrong? When you test weekly or monthly, you know what normal looks like, and that means you can know immediately when values are off and can spring into action. This location in Gatineau is upstream from a suspected pollution source. They test here to provide a baseline for values near the pollution. Before, it’s usually normal. At the source, levels spike into the thousands! Water bodies are all different! Each has its own chemistry, composition, and wildlife. And, these are affected by seasons, environmental processes and other external factors. So, it is important for you to get a feel for what is normal for your body of water. For example, natural levels of conductivity and pH can be different based on the bedrock: the Rideau River has a limestone bottom, and so its pH is usually around 8, and conductivity between 300 and 500, while the Ottawa River has a pH closer to 7 and conductivity from 60 to 100 in unpolluted areas. I know that getting a level of 500 might be okay in the Rideau River, but would suggest something awry in the Ottawa. If you’re not checking regularly, how will you know things have changed? Sustained, consistent monitoring is the best way to know. If you’ve been documenting regularly, (through photos, observations and water chemistry testing) when something has changed, it will cause alarm right away. Many of these are visual: shoreline alterations, colours and even smells are great ways to notice changes, but if you’re not sure what normal is (with proof! ), it’s hard to tell the authorities. Many water issues are invisible, but water chemistry can fill in a few blanks, and help you determine when professional lab testing might be appropriate. Lab testing is expensive and time consuming, and isn’t feasible for every body of water all the time. 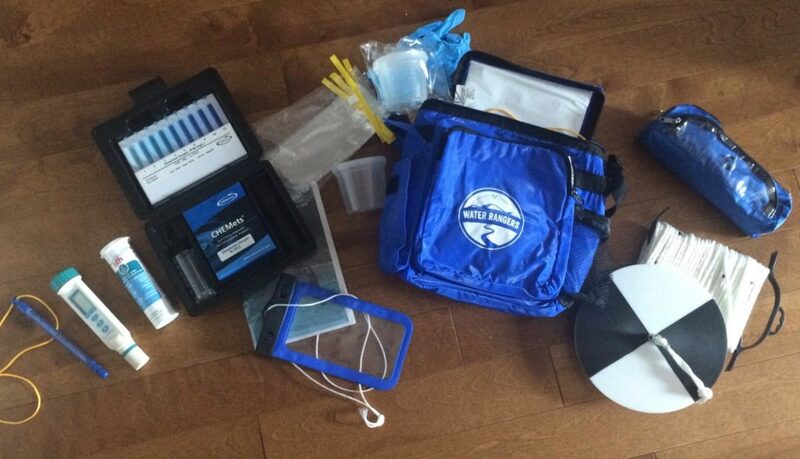 Our test kits and other citizen monitoring kits give general indicators for water quality and let you know when you should maybe dig a bit deeper or contact a local conservation authority or stewardship group to investigate further. We don’t replace lab testing for things like e.coli, nitrates or phosphates. But, funding for lab tests needs to be used strategically, since budgets for testing are tight and Canada has a lot of water! Temperature is interconnected with other indicators, and holds a large influence on water chemistry. Temperature also exacerbates problems: it can encourage increased bacteria and plant growth and reduce the amount of oxygen in the water. A spike in conductivity over your ‘normal’ readings could indicate the presence of inorganic dissolved solids like those found in pollutants. If you test near sewer overflows, or polluted streams, you often get high values. When conductivity levels are too high, it can disrupt the normal functions of an ecosystem and may mean fish have trouble reproducing. Changes in pH, hardness and alkalinity can all indicate a change in chemistry that may have resulted from a spill, sewage or increased algal blooms. For example, algae causes increases in pH because they are consuming all the carbon dioxide in the water. A spike in pH might indicate a growing problem: there’s an optimal level for your waterbody, and raising that could affect everything living in the water. Dissolved oxygen is also a great way to determine if something has gone wrong, but there’s lots of natural fluxation so the best way to determine what’s normal is to test often. It’s constantly affected by aeration (deeper water holds less oxygen), pressure (lower altitudes hold more oxygen than higher ones… think visiting the mountain top), conductivity (higher conductivity or salinity means lower dissolved oxygen) and temperature (colder water holds more oxygen than warm water). A drop in DO (dissolved oxygen’s nickname) in one spot versus another means that you may have a problem. If your DO levels are below 3, fish can’t breath. 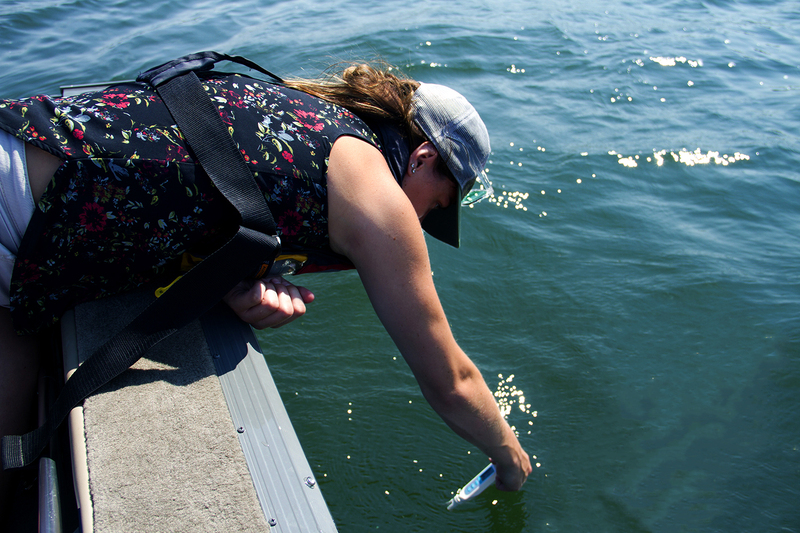 When algae dies off, it can also lead to a drop in dissolved oxygen, which could then lead to massive fish deaths. Your observations and photos! These are so important to give context and remember exactly how things were. Our memories are unreliable things, so always record your details immediately, and take a photo (we provide you with a waterproof phone case so you can do that right there and then). On our data platform, we have little question marks next to every test, where we try and give you information on how to test, why you’re testing for it and what’s a ‘normal’ value. Every test has information so you can learn more! If you’re interested in getting one of our testkits, you can borrow one, or purchase your own. Those who test regularly are experts at noticing: they see and appreciate what’s different. The first step in understanding our waters is to notice it, touch it, smell it, and that leads to a deepened sense of responsibility. Eden and Kirsten, who participated in our Ocean Explorer program last summer, continue to monitor every time they are near the water, especially in Nova Scotia. They love any excuse to go to the water now! While most Canadians say they care about water, many do not participate in its stewardship. Modern society is busy, complicated and confusing, and researching what water chemistry means is often frustrating without a science background. By educating people on the basics of water chemistry and water issues, we’re giving them a chance to start understanding what’s going on, so that they feel they can do something about it. 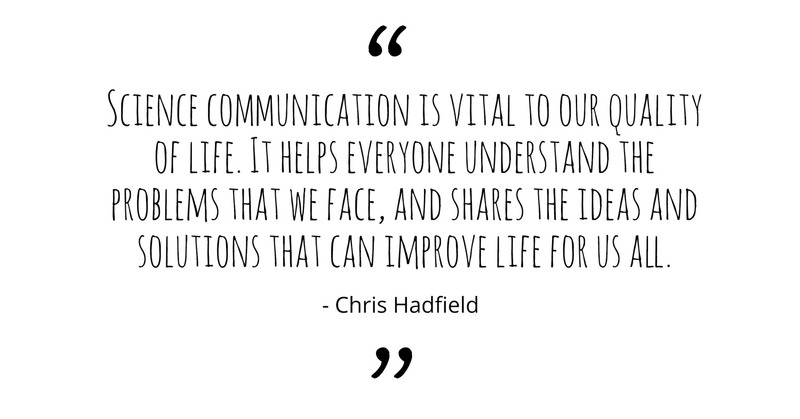 When something is difficult to understand, you often feel disconnected. But when our participants have tried out some tests, understood the basics, they connect to the waterbodies and the issues affecting the water. I personally find testing the water fulfilling and it has deepened my love for my lake. Recently I watched SharkWater, an amazing documentary about the dismal picture for sharks. In it, protected sharks in an eco park off the coast of Costa Rica were being poached for their fins to be exported to Asia for shark-fin soup. Even though the evidence was alarming, and it was illegal, the mob had control over the courts and no one could stop them. But, when the Costa Ricans found out, they began protesting and things weren’t so easy for the poachers anymore. While their struggle is ongoing, it is leading to further protection with more support from people around the world than ever before. Even though solving our water issues can be daunting, the people have more power to change things than they think: every day they are making sure that companies, individuals and our governments are held accountable for their actions, and pushing for higher standards. Public outrage is a great motivator and can be used for good! When we work together, when the community cares about an area, it gets protected. But, it requires sustained effort by lots of people. Get out there and get stewarding! Groups can register here. On our platform, they can then organize their volunteers. If you’re interested in monitoring your body of water, you can sign up for free. You can also look into getting your own testkit. Have more questions? Please contact us.